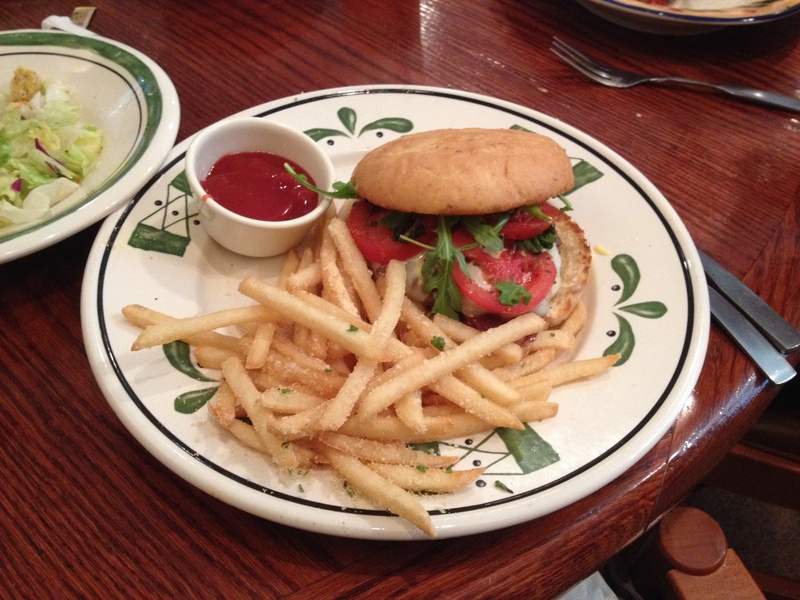 I recently had the opportunity to dine out at the Olive Garden for lunch, and you know what that meant I had to do: Readers with a good memory will recall that one of my first entries involved me kind of mocking the concept of their new lunch hamburger, The Italiano Burger. I had also silently resolved to actually try out the wacky concept if I ever found myself at an Olive Garden at lunchtime. It took over seven months before the opportunity presented itself, and I was ever so slightly surprised that it was still on the menu, I thought that there would be a chance it would have vanished in the time it took for me to get around to trying it. What’s in the Italiano Burger? It is a 6 ounce beef patty topped with crispy Italian prosciutto, mozzarella cheese, arugula, marinated tomatoes and a garlic aioli spread, with garlic parmesan fries on the side. So how was it? It was not a fiasco or failure, it was quite edible, but I feel that it is a missed opportunity as it is presented. My number one issue with it was a lack of flavor, when I had some bites that had enough of all of the disparate ingredients coming together, it tasted good, the problem was those bites were few and far between. The burger needed more cheese (pictures I have seen online of other peoples burgers all seem to have had more cheese on them than mine did), more flavorful marinating on the tomatoes, more arugula, and a lot more of the garlic aioli spread. The burger patty itself was unremarkably pedestrian and more flavor elsewhere would have spruced things up greatly. The crispy prosciutto did not seem special, if anything it resembled bacon too much served crispy as it was. On the other hand, the garlic parmesan fries on the side were very good with lots of flavor imparted by the garlic and parmesan. My brother, who was dining with our group, suggested that perhaps they should have used marinara sauce rather than ketchup for dipping the fries in (it certainly would have been good to add to the burger if that was the case) and it would have made it seem a bit more Italian as well. If you must have a burger for lunch and you somehow ended up at an Olive Garden instead of some place known for burgers, by all means go ahead and get one, it is an acceptable choice, but I think you would be much better served by selecting any of their other sandwich options. My sister in-law had their Chicken Parmigiana Sandwich and enjoyed it greatly, the full sandwich being the same price as the burger and the half sandwich being two dollars less, and all of the other sandwich options come with the awesome garlic parmesan fries as well. This entry was posted in Eating Out and tagged burger, garlic aioli, Italiano Burger, lunch, mozzarella cheese, Olive Garden. Bookmark the permalink.